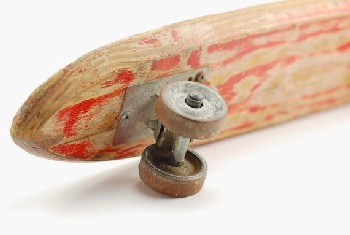 When I was a kid, skateboards were the rage for boys; most of the girls stuck to roller skates. My brothers sure loved their skateboards! Note the steel wheels for riding on pavement and cement sidewalks. 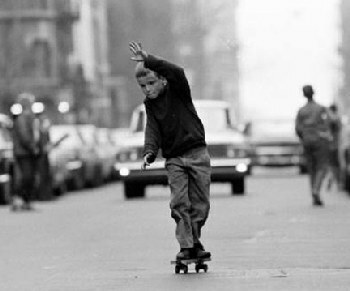 Skateboarding was first documented in the 1950s, by surfers in California when there were no waves to surf. They switched to wheeled boards and took to the streets. Hence the nickname for skateboarding: "sidewalk surfing". Skateboarding has remained popular through the decades, and still has virtually millions of skateboarders involved in the fun. 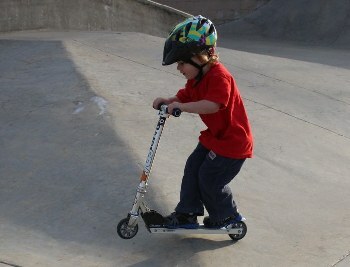 An entire sport has sprung up by "trick-riders"; those kids sure make it look easy. It has even been announced that skateboarding will be an official Olympic sport for the first time at the 2020 Olympic Games in Tokyo, Japan! The latest in personal transportation gadgets is the Hoverboard. What exactly is it? 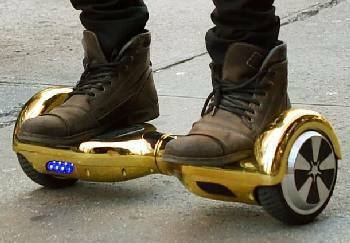 The hoverboard is a self-balancing scooter or skateboard. It has two motorized wheels with foot pads between them on which you stand. You control the speed and direction of travel by leaning, twisting the foot pads or with pressure from the knees (as in the Segway below). These boards were developed with the issuance of tons of patents and brought on numerous legal patent disputes. Hoverboards are a futuristic and totally fun means of personal transport, and have recently exploded in popularity. 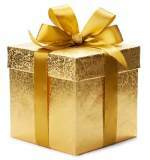 A Huge holiday seller this year. You may be familiar with the Segway, one of the earliest self-balancing transport devices to hit the market. It was developed from the self-balancing iBOT wheelchair, and was launched in 2001. The Segway was initially very expensive, but has come down in price so much that it is now an affordable and popular means of getting around in style. This machine’s 350-watt dual hub motors can get you moving at up to eight miles per hour. While you're cruising, this hoverboard auto-levels for a smooth ride. Razor Stats and Buying info below. Read all about today's Roller Skates here. We found some cool new bikes here: Bicycles & Accessories. Warning: Most airlines have banned hoverboards from being taken aboard planes, both as carry-on items or in checked bags. The concern is that the lithium-ion batteries they contain could catch on fire.